The European car industry has weakened over the past months, with the chances of a recovery any time soon looking doubtful. Harsh austerity measures across the Eurozone have severely impacted the industry, driving demand down. The demand for new cars in the 27-member European Union slumped by 8.2% last year, hitting its lowest level since 1995, Europe's automotive industry association reported. German new car sales data showed a slump of more than 10% in February year-on-year. Tightened consumer incomes, subdued wages and wide-spread austerity measures across Europe, have driven the sales to rock bottom. Overcapacity in the region is also a serious issue in the area. General sentiment is still rather depressing, the president of Renault Nissan, the world's fourth-largest automaker, Carlos Ghosn told the media, speaking at the 83rd Geneva Motor Show. "Capacity is a problem and competitiveness is a problem but these are of second and third magnitude in comparison to the fact that the total market is collapsing," Carlos Ghosn told CNBC. 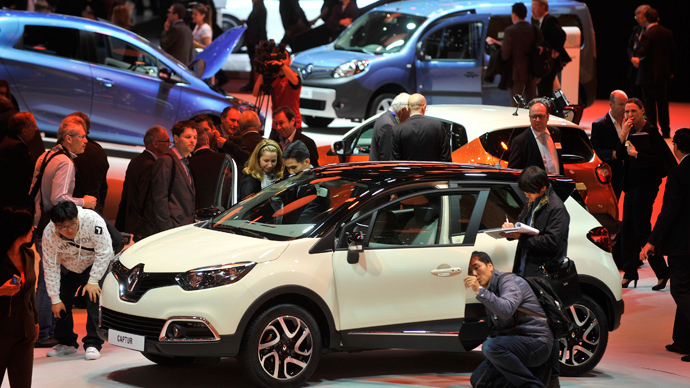 Industry leaders have expressed pessimism about the European car market recovering any time soon. Stephen Odell, CEO at Ford Europe admitted the market would continue to fall again this year. "The way we count Western Europe we would expect it's down between 3 to 5 percent. So it's very tough and difficult," Odell told CNBC. "Frankly, who knows what happens in the second half," he said, as reported by Reuters, adding it could take four or five years for the European market to recover to the 17-million to 18-million vehicle sales range seen in 2007, before the global financial crisis erupted. Even the CEO of luxury car maker Jaguar Land Rover admitted sales in Europe were "challenging" and would remain so for "years to come." "Overall it's challenging especially in the south of Europe but there are some good opportunities in Eastern Europe and the UK is stable," Ralph Speth told CNBC. Chief executive Norbert Reithofer of German premium carmaker BMW similarly warned of a long haul to recovery. "We believe that the underlying problem in Europe, which is mainly about debt, will persist for at least five more years," Mr Reithofer told Reuters. A Europe-wide strategy to deal with the industry's issues is needed, Mr Ghosn told the Sky news. "There should be some kind of European strategy encompassing support for specific technologies, support for the development of specific products," he said.